I've been thinking about it a lot recently and it has dawned on me that although I strive to be creative and think outside of the box for my post content, I don't always reap the benefits for this creative thinking. If you didn't know, one of my "New Year's Resolutions" of 2016 (I know, AGES ago, right?) was to create more creative content on my blog. And I did that and I am so proud of myself for doing that, because I feel like my blog has become more unique. I try to make my ideas stand out from the sea of other content creators out there. However, I haven't exactly been any more "successful" with these posts. On the other hand of the spectrum, I see people that have skyrocketed in terms of their readership that create the same content that is echoed throughout the web. It really hurts me that other people out there are creating simplistic content, that is just like all the other content out there on the web, and they still are successful, far more successful than someone who is more creative than them. I see this everywhere. I'll see the same post or the same YouTube video a thousand times, echoed by different creators. But if they're all creating the same content, are they really "creators?" I just want to be honest, it's hard to be creative. When there are billions of people in the world, it's so difficult to try and create something absolutely different and absolutely unique that no one has come up with. Although this is an instance of creativity, it's not very likely that your idea will be 100% original. So yes, I do expect that a lot of people might have a similar idea, but come on, how many people need to do a "Morning routine" until we realize that it's really all the same? In this day and age of the internet, there's a ton of access to online publications, sources, images, information. In addition, there are a lot of publishers out there. All of a sudden, it's not just the newspaper and magazines out there creating content, there's a rise of news outlets in addition to individual voices online. However, there's a lot more that goes into making content popular. It's not just sending out the newspaper and people read it when they get it, it's about SEO and click-bait and high resolution visuals. All of a sudden, it's not solely about the content anymore, but it's also about the methods and the tactics of spreading media. Titles are exaggerated: "You won't believe this!" or "Shocking secrets exposed!" It's all about getting that click. So when online content is now so heavily reliant on being attention-grabbing to increasingly extreme extents, sometimes the things that become popular are not necessarily creative, but tactful. Yes, creativity is still part of the process, but I've realized that as of recently, having compelling, provocative, thoughtful content is not always what sells. I think that the hard truth about the online world is that sometimes it's not about how talented you are in your field and how insightful you are, sometimes it's just about the skill of getting the click. I've seen fantastic content that is incredibly eye-opening, yet it still gets fewer clicks than "Taylor's Swift's Darkest Secret Revealed", which might just give away some pointless information, like "Taylor Swift doesn't like pizza" or something along those lines. Sometimes it seems like content quality is lacking and even so, thoughtless and unnecessary content still seems to spread like wildfire. So why is that? Why is it that now content quality doesn't matter as much? I think that because there's so much happening now, it has become more about generating clicks and likes and shares. The internet is a business. Everyone is trying to pull in those clicks and views. All of a sudden, it's not just about creating meaningful content, but it's also about drawing people in. After all, how will people see your content if you don't advertise it right? They won't be able to appreciate your hard work if they never see it. However, I think that now people are becoming lost in the first part. Yes, it is super important to make your content appear compelling, clickable, something so interesting that people will just have to read to find out, but I think that it's common to focus so much on being attention-grabbing that people lose their creativity. Looking at the statistics, "Morning routine" videos and tag videos and those kinds of things do incredibly well online. I don't know what's so compelling about seeing what people do in the morning (I mean, you wake up, brush your teeth, fix your hair, etc. It's not that exciting, we all do it?) but there are so many videos of practically the exact same content out there, yet people still continue creating them every single day because they sit well with the viewers. Although I'm not a fan of morning videos, I'm not calling out the people that make them or watch them. What I'm trying to say is that they're overdone. I think that you can do so much more than a video that has been done a million times already. It's not about recreating something that has already been done, tested, and proved popular, it's about creating new things. Although I agree, it is very important to tailor your content to fit the target audience, there comes a time when you need to reevaluate if the content is still quality. Would you actually be interested in what you're putting out there online? It's great to put out content that people like, but it's also important to consider whether this content is just being made to become popular or if it's something that you're enjoying making. The internet is a business, but life isn't all business. It's satisfying to become more "successful" and generate more views on your content, but it's also important to keep in mind your own personal enjoyment out of cultivating content. Is this content just for other people or is it for yourself too? Being creative is also about your own happiness, making things that you're proud of, that you know are unique and thoughtful and stand out from the masses. Branding and selling your content is vital to online publications and media, but it shouldn't be the whole thing. 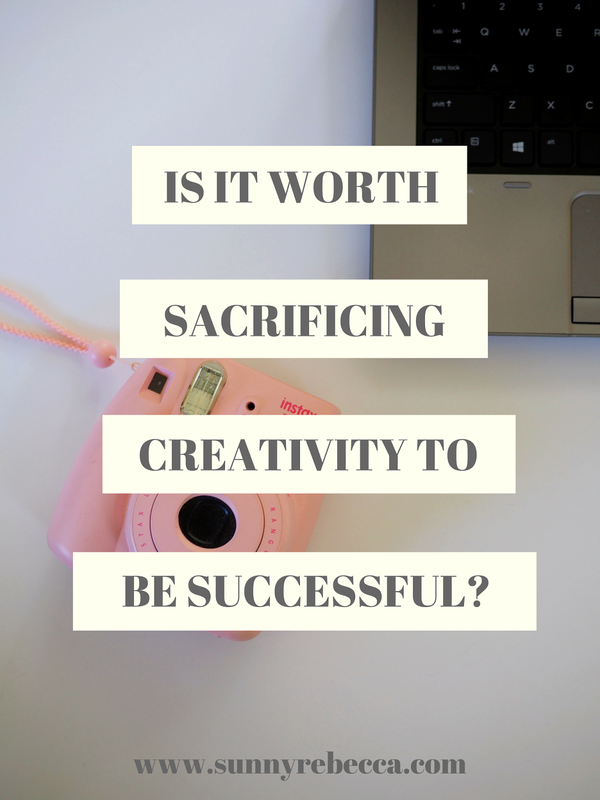 I think that it's not really worth sacrificing creativity in order to gain more clicks. Although it's tempting, I don't want to look back on life and realize that I had been doing things that didn't make me happy because I had been so caught up in doing things that appealed to others. As a creator, it's not only about sharing your content, but it's also about your own personal fulfillment from creating and you don't want to realize that you're not feeling fulfilled from creating content that you don't love. So be creative. Be innovative. And don't let your temptation to follow everyone else in order to gain views lead you away from what you're here to do. And that's to create. To create ideas, to promote values, to reach out and to touch the lives of the viewers. Because at the end of the day, isn't that really what matters?